The Coca-Cola Christmas Truck Tour is rolling into towns this holiday season and handing out sugary, fizzy drinks. Despite the well-documented child health crisis with 1 in 3 children leaving primary school obese or overweight, with soft drinks being the single largest contributor to children’s sugar intake, Coca-Cola are stopping in locations with some of the worst diet-related health problems. Whilst fewer local authorities are hosting the truck this year than last, ten of the stops will be in ASDA and Tesco car parks. 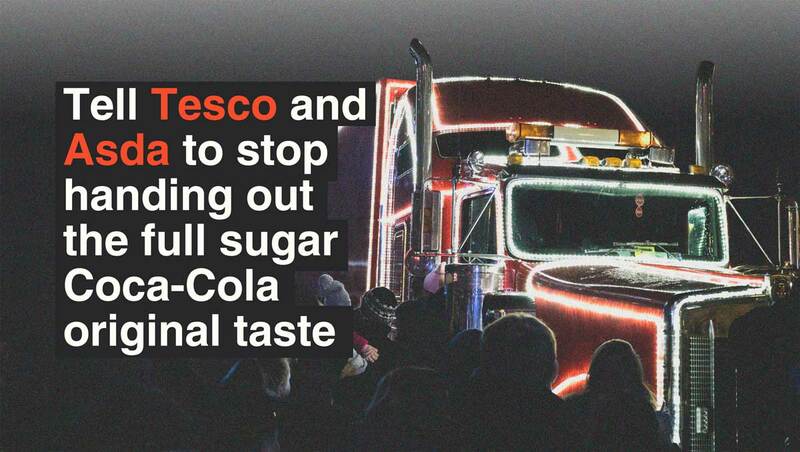 Join us in calling on ASDA and Tesco to commit to not allowing hand-outs of sugary drinks and to review their position about inviting the Coke truck back next year. I am writing to you regarding my disappointment that you are hosting the Coca-Cola Christmas Truck Tour on your land this holiday season. By hosting the Coca-Cola Truck Tour, your organisation is allowing the promotion of sugary drinks to the general public, particularly to children and young people. The Truck Tour has one objective and that is to increase sales. It encourages instant recognition of its most sugary and unhealthy product. At a time when childhood obesity rates have reached record highs, such promotional tactics are not just in poor taste – they urgently need to be brought to a halt. Childhood obesity figures have again risen this year and show no signs of slowing down. The latest figures reveal that almost one in four children are overweight or obese when they start primary school and over one in three by the time they leave primary school. If we don’t take drastic action, half of all UK children will be overweight or obese by 2020. I want you to do two things: to call on Coca-Cola to commit not to hand out sugary drinks on your land at all, and secondly, not to invite the Coca-Cola Christmas Truck Tour back next year, in order to bring your position on this issue in line with your other messaging on healthy eating. Please send me the SUGAR SMART enewsletter.